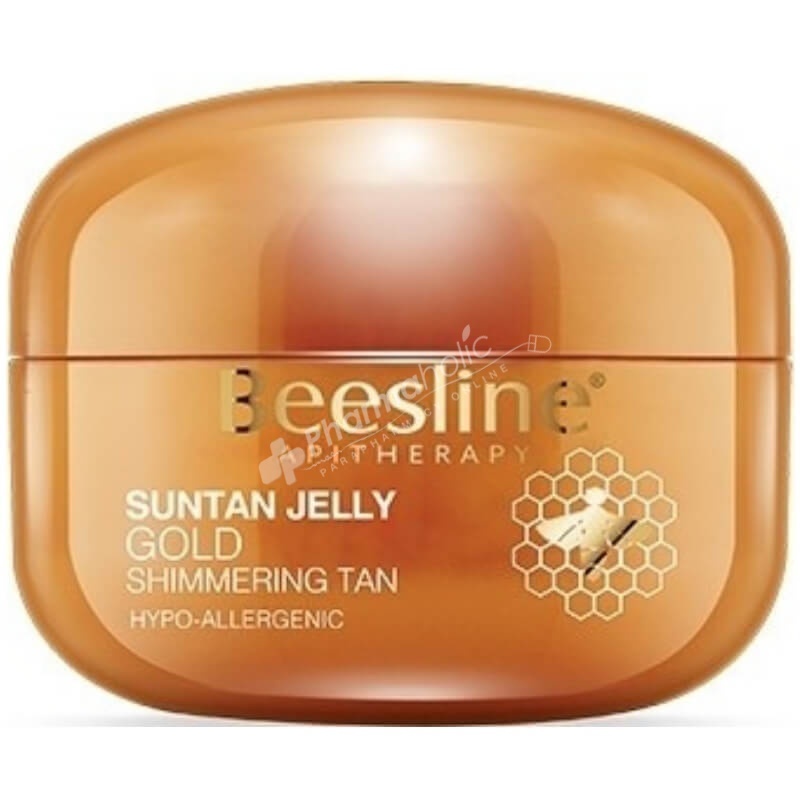 Beesline Suntan Jelly Gold provides skin with an instant glow while helping you develop a deep tan. Your skin glitters and reveals its beauty whenever you move. A healthy pot of golden goodness that helps deliver a deep tan with a shimmering glow while nourishing & moisturising the skin. Free from ethyl alcohol, parabens, petrochemicals, phthalates, silicones and ingredients of animal origin (except bee by-products). BEESWAX (Cera Apis Mellifera) is a nutritious substance rich in vitamin A, beneficial to cell reconstruction and in specific fatty acids, compatible with skin lipids. Beeswax acts as an emollient and humectant to regenerate and soften skin by drawing moisture to the surface and sealing it in. GOLD is a pure precious mineral that has been the secret to maintaining youthful looking skin for centuries. It acts as an antioxidant smoothing out wrinkles, cooling the skin and protecting it from inflammation. Apply generously on the body before sunbathing. Reapply regularly, especially after swimming and towel drying. If you have a fair complexion, mix the oil with Ultrascreen Cream SPF 50. After showering apply Beesline After Sun Cooling Lotion or Repairing Milk. Prunus Amygdalus (Almond Oil), Sesamun Indicum (Sesame Oil), Triticum Vulgare (Wheat Germ Oil), Heliantus Annus (Sunflower Oil), Carota Sativa (Carrot), Cocos Nucifera (Coconut Oil), Nigella Sativa (Nigella Seed Oil), Lawsonia Alba (Henna Oil), Cera Alba (Beeswax), Aroma, tocopheryl Acetate (Vitamin E).